Pepper asks Daniel Fitzgerald to keep an eye on Ringo for her. Karl wants to enter a radio singing competition. Ringo signs up for a swimming trial. Pepper wants to take a new job in Queensland, but Adam isn't so sure. Tim is talking to Elle - Sebastian thinks it's excessive for Elle to have two assistants. He wants Elle to make the decision on who to sack - Paul or Oliver? Ringo is staring at his food when Pepper comes out to hang up the washing. Pepper isn't sure that Ringo can handle the swimming try-out but he's confident he can manage. Pepper is still worried about leaving Ringo - he needs someone to support him through his eating disorder. Ringo insists he's fine. RINGO: Word at school is- you've got a better job and you're not coming back. PEPPER:(uncertainly) I don't really know about that. I mean...it's all still up in the air. Adam has overheard the tail-end of this conversation and calls Pepper over. Ringo eats his toastie and tells Pepper he'll really miss her. When she's gone, he spits it out. ADAM: 'Up in the air'? You haven't called them yet have you? When were you going to tell me, Pep? PEPPER: At the right time. ADAM: I'm just not important to you, am I.
ADAM: I'm sorry. Have a good trip. Declan and some guys are bantering when Ringo comes in to change into his swimming trunks. He's surprised to see Ringo there as Rachel and Zeke told him that Ringo was afraid of water (At last! Someone remembers!). Ringo reckons he's been having swimming lessons for six months and he's going for it. Ringo appears to come over all dizzy for a second but he shakes it off and follows Declan out to the pool. As he leaves the changing room he checks out his muscles in a mirror. Declan sees him and thinks this is a bit weird. Daniel Fitzgerald is organising the swimming trial and soon puts Justin, who is mucking around, in his place. He spots Zeke swimming and tells him to keep something back for the race. Zeke says that he hadn't intended to compete - he was just swimming for fun. Daniel tells him that if he swims that fast for fun, he'd have a great chance in the trial. Zeke agrees to give it a go. JUSTIN: Got some spare flippers for you mate. Daniel spots Ringo who is leaning heavily on a railing not looking at all well. He covers and goes off to start the swim. Paul and Oliver are having a "de-clutter" and are putting half of the contents of Paul's house on the street for collection. Oliver is bemoaning having a "formal meeting" with Carmella. Paul insists that he's not getting a new kitchen like Elle wants - he has to get rid of stuff, not add more, to make room for Rebecca and Declan. They don't have much stuff now, but once she's hit the shops his house will soon be full(!) Elle comes out with some ugly statues of...er...dogs? perhaps. Paul asks her how the meeting went with Tim but she is evasive and says they'll talk about it later. Lou and Janae are fighting over some skis, pulling one back and forth. LOU: Oooh my bad back. Don't mind me, will you. It's only agony. JANAE: Well then you won't need skis, will you?! Oliver, Paul and Elle sit down on a discarded mattress to watch the show! Oliver and Paul bet on the winner of the fight(!) Unfortunately Ned distracts Janae and Lou steals the ski! Oliver coughs up his $10! Mickey comes up to Lou and asks him to come and play with him and Tyler - but Lou is too busy scavenging. Mickey and Tyler look downcast, but decide to lift their spirits with a game of hide-and seek. Zeke, Declan, Justin and Ringo have just started their try-out. Zeke takes the lead easily but Ringo is struggling after one length. Halfway down the second length he falters and Daniel is forced to jump into to rescue him. He tows him to the side and holds Ringo there. Ringo is gasping for breath. The taxi has got a puncture and Frazer is trying to change the wheel. Karl is not making things easier by berating Frazer for not being more proficient at mechanics - after all, he is a professional driver now! KARL: You have turned the meter off, haven't you? FRAZER: Sorry mate, passengers risk. FRAZER: Course I've turned it off, you goon! They chat about Susan's case and Karl tells him that he's adapted one of his songs to dedicate her - that's where he's going now, to the radio station. KARL: You've heard about my music? He goes back to changing the wheel. KARL: I'm entering the Triple E talent contest. They're looking for talent all over the country. Could be my big break! ...If I ever get there. KARL: I'll tell you what. I'll put the demo on for you. It'll lift your spirits, while you work. FRAZER: Oh, no need, mate. My spirits are tip top. But Karl's mind is made up and despite Frazer's protests, puts the CD in the CD player in the taxi. FRAZER: (grasping at straws) I don't really like...music. Ever. But Frazer is treated to a loud rendition of "River of the Soul". He redoubles his efforts to change the wheel! Mickey hides in a large box that is out with the rubbish for collection, despite Lou warning him not to. Janae is messing around with a discarded telephone. JANAE: Hey, Ned. Ned! Australian Idol's on the phone! Ned is going through some old comic books and has also found some scuba gear. A hopeless convert to scavenging, he and Janae head off to try their luck in another street! Tyler asks Lou if he's seen Mickey. Mickey giggles inside the box. Frazer draws up outside the radio station, much relieved to have arrived at his destination. KARL: What do you think? FRAZER: I think that'll be fifty-five dollars, ninety. I think I've earnt every cent. FRAZER: Because you're a mate, I'll knock off 5 bucks. FRAZER: Take it or leave it. FRAZER: Whoa ho! I'm wishing! (but the CD is stuck in the player) Oh dear god, no. KARL: No, no. Careful. Careful. Just then Marcia Hines of Australian Idol fame walks up looking for a taxi! 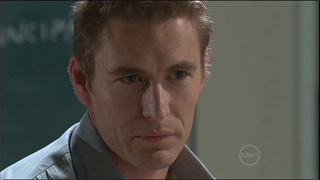 Karl takes the opportunity to hijack her cab ride into the city to try and get Marcia to 'discover' him. Frazer finally gets the CD to stop, but Karl makes him start it up again. The guys are impressed with Zeke's swimming performance, but taunt Ringo. Declan tells them to rack off. Daniel comes in and asks Ringo how he is. Ringo gets all steamed up. RINGO: Why does everybody think there's something wrong with me? DANIEL: I beg your pardon? DANIEL: See me back at school, please. Frazer, Marcia and Karl have arrived at their destination. FRAZER: I apologise for the music, Ms Hines. MARCIA: Oh no. That's okay. KARL: Ms Hines? I'm so sorry. Of course, you're Marcia Hines, Queen of Pop! Karl fawns over Marcia, telling her what a great singer she is and what a big fan he is of hers. FRAZER: Please stop harrassing my customers Karl. MARCIA: No, it's OK, I'm always very happy to meet a fan. KARL: Oh I am. A big fan! Huge fan! So come on, tell us! Who's going to win Idol this year? FRAZER:(long-suffering) I think the people of Australia decide that, mate. KARL: You must have an opinion, they're all so talented, aren't they! You must find it inspiring, discovering new talent where you least expect it. KARL: Do you like the kind of emotional singer/songwriter vibe that touches the heart strings? Karl is desperate to know what Marcia thought of his music. MARCIA: What I really like is music that's got flavour. KARL: So, what do you think of the CD that's playing now. For "River of the Soul" is still blaring out in the background. MARCIA: Speaking of which, what was that being played in that cab?! KARL: It's confession time - that was my demo! MARCIA: Oooh that was so nasty. KARL: Nasty, as in good? MARCIA: Nah. Nasty, as in really, truly bad. Marcia manages to ejects the CD, much to Frazer's delight. FRAZER: Oh, Ms Hines, what did you...? Oh my god. You are a lifesaver. This trip is on me. FRAZER: No, no, thank YOU! KARL: Do you have some advice for a budding singer/songwriter? MARCIA: I do. I do. Look, You really don't have the music in you. But, you stay true to yourself. You guys, take good care. See you! KARL: She's a great singer. I think Dicko is the better judge. Back at school, Ringo tells Daniel that he's fine, he just should have trained better. Daniel isn't convinced, but doesn't say anything. DANIEL: You'd let me know if anything was bothering you, wouldn't you. RINGO: Sure. I'll see you tomorrow. Mickey is still hiding in the chest when Janae and Ned get back from their scavenging. Tyler meets them and tells them that he can't find Mickey - they were playing hide-and-seek but he couldn't find Mickey. It's time for him to go home now. Micky lifts the lid of the box slightly and giggles. Ned and Janae go off to search for him. REBECCA: I'm sorry, but touring around wineries just doesn't sound like suffering! Paul and Oliver are getting on like a house on fire and explaining that they're looking for quality wines for Lassiter's. REBECCA: You're quite the team aren't you! Elle has come in and heard this exchange. She sits quietly, despairing of what to do. ADAM: Life's too short to be without you, gorgeous. We'll work out the details when we get there. ADAM: I love you too. Janae and Susan hugs Pepper goodbye and then it's Rosie's turn. ROSIE: I'm going to miss you. PEPPER: I have to tell you something. It's about Ringo. PEPPER: He hasn't been eating. ROSIE: (shocked) Oh my God, for how long? PEPPER: A while, but I think he's OK now, would you please just keep an eye on him for me? PEPPER: And don't tell Frazer. PEPPER: Please...I promised him I wouldn't say anything and it'll just ruin everything. Please? ROSIE: Brothers. You sure he's over it? PEPPER: No, for everything. Ever since I came here, you've been my best friend and I love you, so much. They hug and start to cry. ROSIE: I love you too. Susan and Janae wave from the sidelines as Pepper gets into the cab, and Ringo too. Ned is still looking for Mickey as the cab drives off. But Mickey is keeping schtum in the box. He's about to come out, but the lid accidentally slams down hard and locks fast. MICKEY: Dad! Janae! Please help! Dad! Help me!